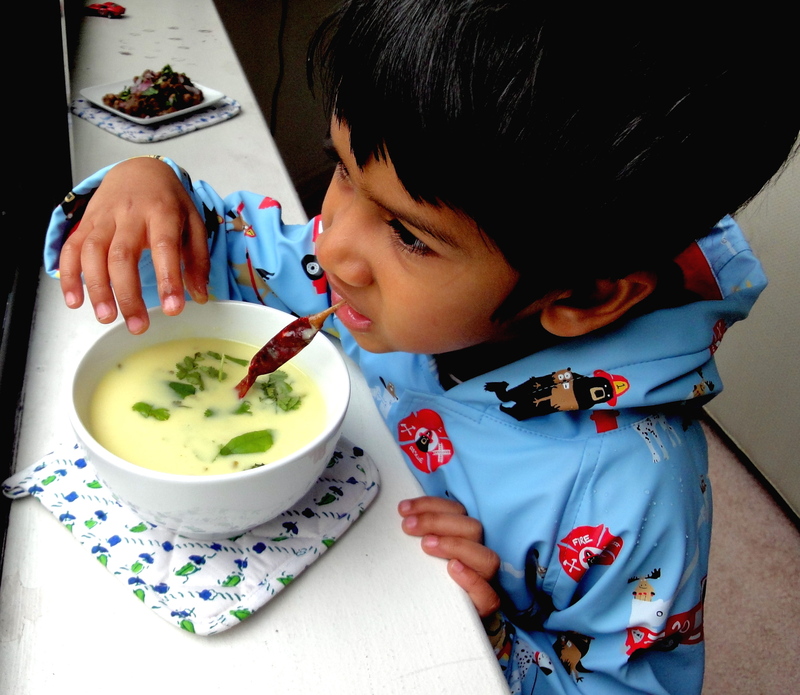 During my second pregnancy nothing tasted better than a simple meal of Gujarati kadhi and rice. Kadhi is a light yogurt curry that is flavored primarily with curry leaves and thickened with a chickpea flour called besan. It is simultaneously spicy, sweet, salty and sour and has a mild, soothing texture. My recipe for kadhi took a while to perfect. Instead of experimenting with my usual weekly, let’s try this in any way that makes sense, I tried to be more intelligent. First I consulted a recipe that I found online, and made it according to the complex, many layered instructions that were provided. Separate tadka, separate boiling of kadhi in a pot coated with oil, too much stirring. What I did like was the proportion of water : yogurt : besan which was 2 cups water : 1 cup yogurt : 1/8 cup besan. Although some of the seasoning ingredients seemed fine: mustard seeds, green chillies, curry leaves, heeng, the kadhi lacked tartness and seemed to be missing several flavors that I couldn’t identify. I called up Kirti behn, my old Gujarati cook. Did you add jeera, she asked? How about a clove? And chopped cilantro leaves are a must, she added. How do I get the sour flavor, I asked, given that my plain yogurt wasn’t too tart? Keep boiling it for a while longer, and add a few more sweet curry leaves and chopped cilantro, she said. The next version was much better. On a recent trip to Rajbhog foods in Journal Square, I discovered pieces of cinnamon stick and bits of minced ginger in their lovely, pale yellow kadhi. I made another version. Much better. Here is my final recipe. 1. Whisk the yogurt with the besan and turmeric for a few seconds until smooth. Add 3-4 cups of water and set aside. 2. Heat the oil in a heavy bottomed pot. Add the tarka ingredients – heeng, cloves, cinnamon, dried red chilli, green chillies, cumin seeds, and ginger. The cumin seeds should sputter, and the ginger should cook for a few seconds. Immediately, add the yogurt mixture. 3. Bring to boil on medium heat and then reduce to simmer. Add sugar and salt to taste, along with the curry leaves. Continue to simmer on low heat for 15-20 minutes. Stir occasionally. When you taste the kadhi, there should be no taste of raw besan flour. If you find the kadhi bland, try adding a few more curry leaves and a few sprigs of cilantro, and adding a pinch or two more of sugar and salt. Boiling it a little longer also brings the flavors together. The kadhi usually improves in taste the next day. Garnish liberally with coriander leaves before serving. That’s cute picture. Lovely kadhi. 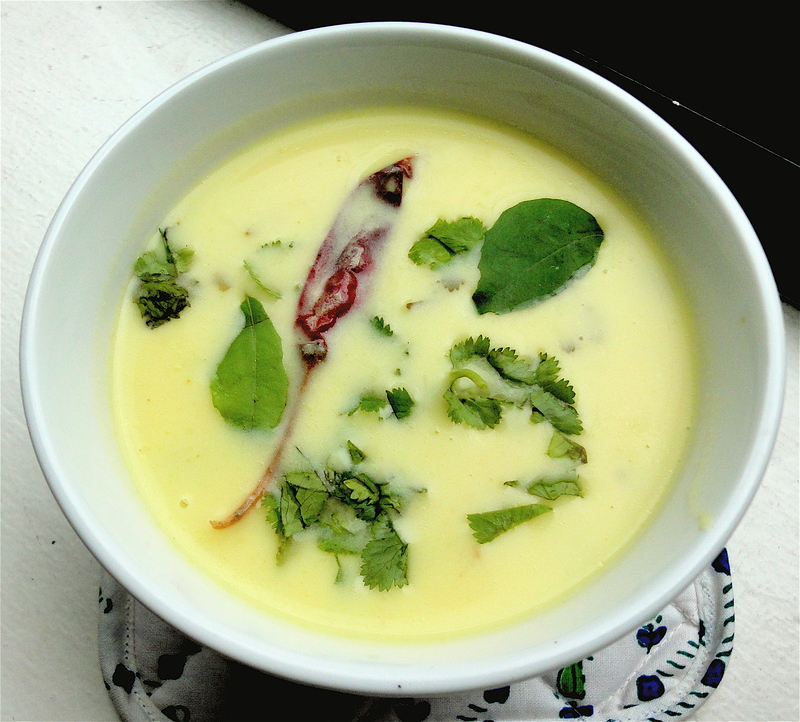 Yum… I love Kadhi. Love A’s pic… he goes for the red chilli huh? So I made this as well – ur blog has become my cooking bible 🙂 Came out yummy.. thanks Devika! Btw, for making yogurt more tart, add some salt to it, whisk and leave it outside the refrigerator in a warm place for a couple hours. My bhabhi does that and her kadhi is always incredible. Great tip about the yogurt, Varada. Thank you for the comment and link! Hi, its really very appreciable recipe, but i can suggest some changes in your recipe, as i am form Gujarat and we are making kadhi almost daily at our home. 1. First of all make buttermilk of the yogurt and then add besan in it and blend it well with electric or hand blender. 2. Add 1/4 tsp mustard seeds in tarka. 3. Add1 tsp cumin seeds instead of 1/2 tsp. 4. Use crushed (with hand pounder) green chilly instead of half cut. 5. Add 4-5 black peeper corns in tarka. All other ingredients and procedure is as per yours. love your suggestions – thank you!